SANTIAGO, Sept 3, 2011 (AFP) - All 21 people aboard the Chilean air force plane that crashed into the Pacific on its way to a remote archipelago died instantaneously, the defense minister said Saturday. "Based on observations and the search we carried out with the air force commander, we have reached the conclusion that the impact was such that it should have resulted in the instantaneous death of all of those who were aboard the aircraft," Defense Minister Andres Allamand told reporters. 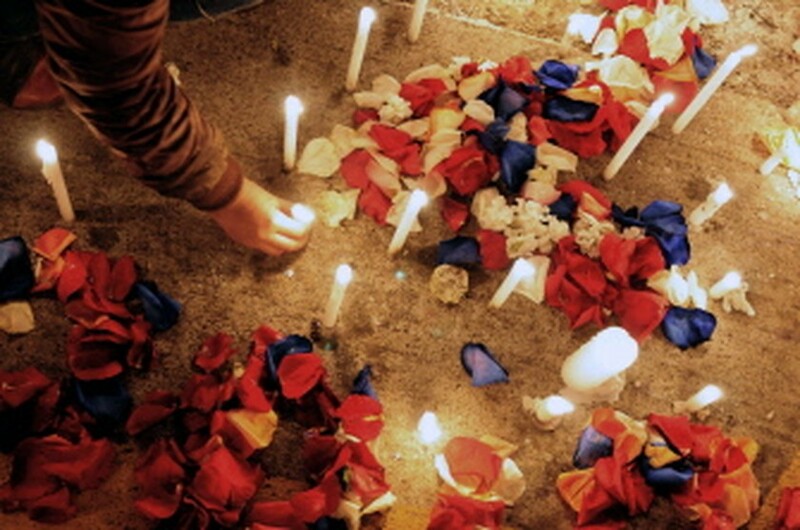 AFP - Chileans light candles in homage to Chilean TV host Felipe Camiroaga, outside the National Television headquarters in Santiago on September 3, 2011. A major search operation had been launched late Friday in the waters around Robinson Crusoe island in the Juan Fernandez islands, some 700 kilometers (435 miles) west of the South American coastline, and some debris from the missing plane has been located in the sea. So far, only four bodies have been recovered. "We have found two female bodies and two male bodies; in none of the cases have they been identified," said air force chief Maximiliano Larraechea. As Chile's navy and air force headed the search, fishermen in their boats left the archipelago early Saturday in the hope of turning up survivors. Allamand said the plane, a turboprop-powered Casa 212, made two attempts to land on the main island but failed, "after which contact was lost." Strong winds were being blamed for causing the light aircraft to be blown off course, but it was unclear what had definitively caused the crash. The air force earlier said that as the aircraft was "getting closer to the island, radio communication with the plane was lost," prompting the launch of the search effort. Government spokesman Andres Chadwick said the bodies identified were those of Erwin Nunez, an air force corporal; Galia Diaz, with the National Cultural Council; Roberto Bruce, a TVN network journalist; and Silvia Slager, a TVN producer. Among those whose bodies were not yet found were popular Chilean television host Felipe Camiroaga, who was part of a TVN crew heading to the archipelago to report on reconstruction efforts following a huge February 2010 earthquake and tsunami. Tributes poured in from across South America for the victims. Pope Benedict XVI said he was "deeply saddened" to learn of the accident, in a message relayed by the archbishop of Santiago, Ricardo Ezzati.